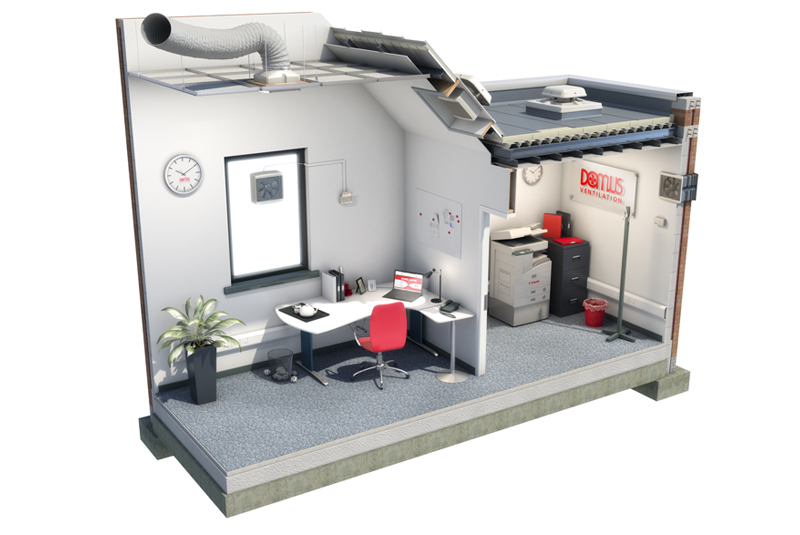 David Treharne, Senior Engineer at Domus Ventilation, considers how to achieve affordable, effective ventilation. No one likes being in a room that’s dank, breathing in stale air, even for a short period of time. It’s not only unpleasant but it’s also unhealthy for the occupants and for the building itself. Poor indoor air quality has known links to allergies, asthma, lung cancer, chronic obstructive pulmonary disease, cardiovascular disease and even dementia. For the building, surface condensation formed from poor ventilation can lead to significant structural problems and costly redecorating. Indoor air quality is determined by a number of factors, including the quality of the outdoor air, indoor pollutant sources (e.g. cleaning equipment), the activities within the property and the physical features of the building. In light commercial settings, kitchens and bathrooms are usually the most affected areas, but buildings with bin stores, communal areas and even meeting rooms can also be problematic. Mechanical extract fans designed for the commercial market can be effective here, depending on the size of the area and the level of contaminants and moisture in the air. Getting the balance between fan performance and noise levels is important so look for a fan with a high efficiency impeller and external rotor motor that also operates quietly to avoid disturbing occupants; Domus Ventilation D SERIES fans operate up to 530l/s or 1908m3/hr and with sound levels as low as 31dBA. Minimise energy consumption by opting for fans with an economy speed setting and also look for those that can be used with a range of sensors such as PIR, humidity and a run-on timer so you are not restricted to just one option. Where you have a number of fans in place, a speed controller that connects to multiple fans is very useful. Although harder to find, fans are available – including the Domus Ventilation D SERIES – that feature Supply and Extract technology so not only can you use the fan to extract stale air but also to feed in air from outside. Whilst motorised extractor fans are ideal for dealing with ventilation in well-defined areas (mostly single rooms), there are many occasions where a more sophisticated and powerful solution is required, especially where there are multiple rooms in need of extract ventilation and the air change requirement is more onerous, e.g. in shared accommodation such as student flats or care homes. Here, a Mechanical Extract Ventilation (MEV) system should be considered. MEV systems are most suitable for new properties although can be retrofitted as long as there is access in ceiling voids for duct runs. MEV systems provide excellent ventilation, are very easy to use (mostly a fit and forget scenario as they don’t have filters that need changing), are cost-effective in terms of capital outlay and operating costs and are straight forward to install. On the installation side, MEV systems require minimal ducting and do not require each room’s outer wall to be drilled for an extract fan – even more handy if wet rooms don’t have access to an outer wall. There are a wide range of MEV units in the marketplace to choose from. When looking at suitable units, firstly ensure it has been designed for the commercial market, as residential MEV units will not be powerful enough. Domus Ventilation’s CMX-S, for example, can extract up to 120l/s. Consider where the MEV unit is going. Generally, they are fitted in lofts or cupboards but if that isn’t an option then opt for a smaller unit that can fit in a ceiling void, such as Domus Ventilation’s CMX-S which is the only unit on the market at just 125mm deep. Also look for units with a versatile design that allow them to be installed horizontally or vertically, ensuring ease of installation in limited or awkward spaces. As is the case with extract fans, you want to ensure maximum performance with minimal noise. To achieve this the MEV unit needs a good quality Electronically Commutated (EC) motor plus, ideally, direct connection to the ducting (without the need for adaptors) which maximises airflow performance as well as significantly reduces system noise. A low Specific Fan Power (SFP) is also ideal to keep energy usage down to a minimum; Domus Ventilation’s CMX-S has an SFP of 0.24W(l/s), well below the 2010 Building Regulations Part L threshold. Whilst MEV systems operate continuously, those that have a high-speed boost flow come with a variety of control options for you to consider with the most common being a straightforward switch; a combined PIR sensor and timer which detects the presence of someone; a combined humidity sensor and timer; and the increasingly popular integral humidistat that identifies changes in humidity and automatically adjusts the air flow of the unit accordingly. A stuffy room is the direct effect of poor ventilation; it’s uncomfortable to be in and can affect the health of the occupant. Mechanical ventilation is necessary to maintain a healthy, breathable atmosphere, but doesn’t have to cost customers the earth or be difficult or complex for you to install.